I love the way light plays through glass. 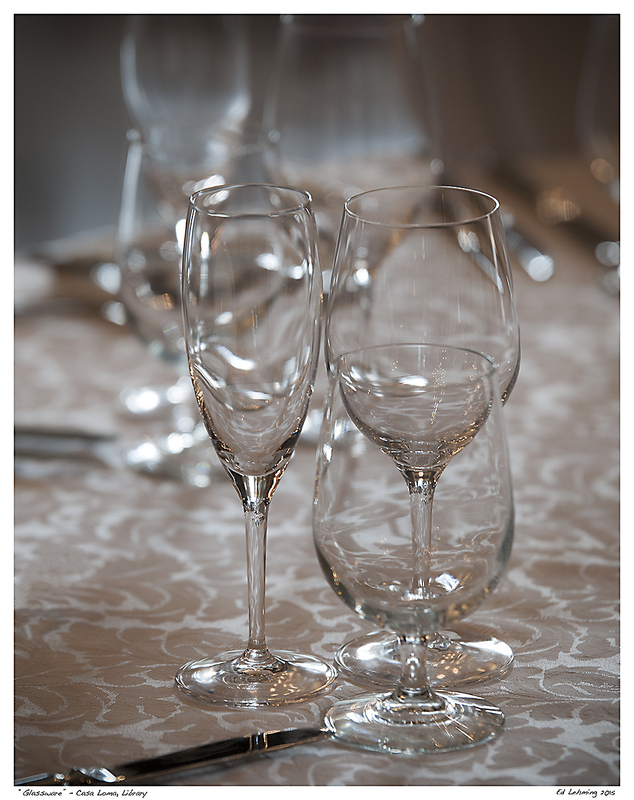 In this case, a set of glasses set up for a formal dinner in the Casa Loma library. We did the ‘tourist’ thing a week ago with our cousins from California. It’s been a very long time since I have visited Toronto’s castle. The library is a large room that has been repurposed as a formal dining room and these glasses were set up on one of the many tables. It seemed like a nice shot, with the light coming in though a distant window. The natural light intensified the gold colour of the damask table-cloth, making the glasses glow with gold flecks. It’s probably not a prize winner but an interesting image for me. I just like the way it looks. If I had to re-compose the image, I would have moved further to the right and centred the front glass a bit better. This entry was posted in Photography and tagged Casa Lomoa, drink, formal, glass, gold, library, light, table, Toronto, tourist, wine on September 30, 2015 by Ed Lehming Photography. Another long exposure from my visit to Toronto’s Casa Loma. This one is from the Conservatory. A bright spacious room, with a stunning stained glass domed roof. The Conservatory once once held beautiful plants in all seasons. Today it is largely empty but beautiful, nonetheless. The Conservatory is surrounded by large, ornate windows, has Italian marble floors in pink and grey and the walls are lined with pink Ontario marble, quarried in the Bancroft area. 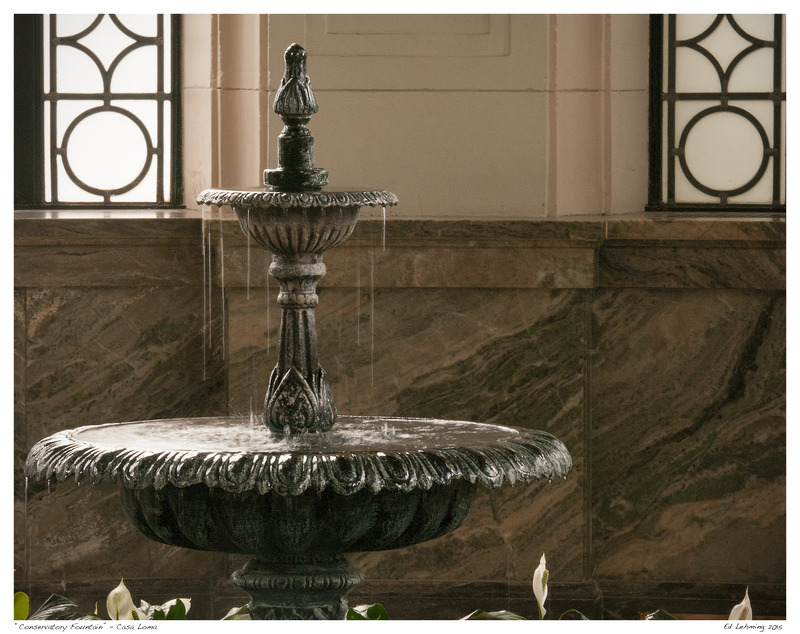 I was fascinated by the fountain, located in an alcove, which was running very slowly and I wanted to see what the image would look like as a long exposure. By Tamron 70-200mm f/2.8 has incredible vibration reduction, so I took my chances on a narrow aperture, long exposure, to see what the final image might look like. The image above is the result of a 1/8 sec handheld exposure. It freezes the water drops as they fall from the fountain bowls, yet still captures the details of the fountain itself. I have not been to Casa Loma for about 40 years. My last memory was going there on a school trip, but I remember how grand the building was. It was definitely worth the re-visit. This entry was posted in Photography and tagged aperture, architecture, Bancroft, Casa Loma, exposure, flow, fountain, history, long exposure, Marble, Pellatt, slow, Toronto, Water on September 24, 2015 by Ed Lehming Photography. On a recent visit to Toronto’s only castle, Casa Loma, I set out to make my photos with existing light only. 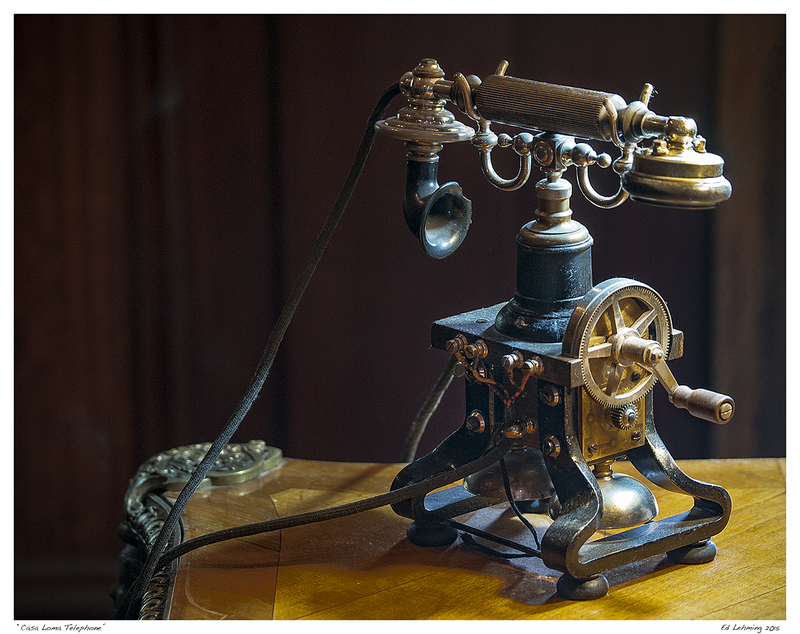 It would be an interesting experience, since the castle is filled with so many 20th century items, including more telephones than I could count. It seemed every room and hallway had a phone. I suppose I should not be surprised, since there are 98 rooms in the 64,700 square foot building. The lighting that day was very nice and I was able to make several photos of rooms and architectural details. This photo really appeals to me. Given the light coming in through the window and the dark to gold tones on the old telephone in Sir Henry Pellat’s Study, I was able to capture the image in a style that resembles a Dutch Golden Age or Baroque style. And, as I look at the image, I can only imagine the conversations that took place on this phone, so many years ago. As I said earlier, this image was made using existing light only. Something the technology of modern photographic lenses makes possible through advanced image stabilization and fast optics. I was able to shoot this at 1/15th of a second, handheld, which is pretty awesome and opens up so many possibilities. This entry was posted in Photography and tagged 20th Century, Baroque, Casa Loma, castle, gold, Golden Age, lens, light, long exposure, old, optics, phone, Toronto on September 24, 2015 by Ed Lehming Photography. This beautiful statue sits outside the Canada Post Office at Sparks Street and Elgin St. I was standing outside, waiting for the rest of my group to mail something and thought this might make a nice photo. It was mid-morning and the light was softened by a low cloud deck. All the elements seemed to be aligned. The colour version was quite nice, but I really like him in black and white. All the tones and structure seem so much more pronounced. There is something about stone carvings that appeals to me. I can imagine the artist working on it and carving all the fine details. The other nice feature about this statue that I am more aware of now, is that it is not covered with ‘anti-pigeon’ spikes. I see that in a lot of old buildings lately. It was not something obvious, but when I review the photos I can’t help but notice. The netting and spikes keep the stone clean, but they sure a distraction from the fine workmanship. I guess it’s all about compromise. 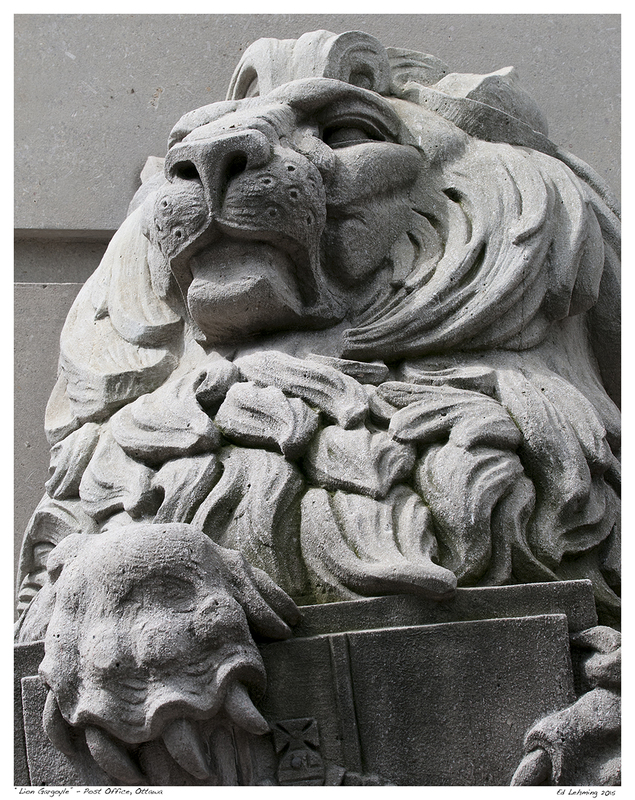 This entry was posted in Photography and tagged artist, black and white, carved, gargoyle, lion, Ottawa, Post Office, statue, stone, texture, tones on September 17, 2015 by Ed Lehming Photography. I find myself going back to my photo abstractions frequently. They bring me great pleasure, in that I never know quite how they will turn out. Don’t get me wrong, these are very deliberate photos, and I have a vision in my mind of the outcome. But, the random elements; light, speed, colours, and focus, all add their own unexpected twist to the final composition. Case in point with the image above, I can see the scene very clearly and it lends itself well to a vertical pan. What I can’t predict, at least not yet, is what the effect of random branches across tree trunks, background reflections, and ambient light might have on the whole photo. I saw the branch across the tree in the forefront, but had no idea how the soft green leaves might play in the whole image. This image was the result of a quick lunchtime excursion to a local conservation area. I just needed to walk among the trees. Being in nature is the place where I can really experience ‘living in the moment’. For some time, I was not sure what that expression meant. Apparently, this is a rare gift in our fast paced world. In the woods, the outside world melts away, and I am at peace. There is only me and only this place exists to me, at this moment. This place becomes my world and what is beyond is of no consequence. So, I am grateful for the ability to capture those moments that captivate me, while i’m in the moment, and share them. Hopefully, this image will resonate with others. I called named the image “Into the Woods, Darkly” because of all the dark spaces I saw below the trees, even thought the sky was bright. The photo technique brings all the dark places into the light, which I found interesting. 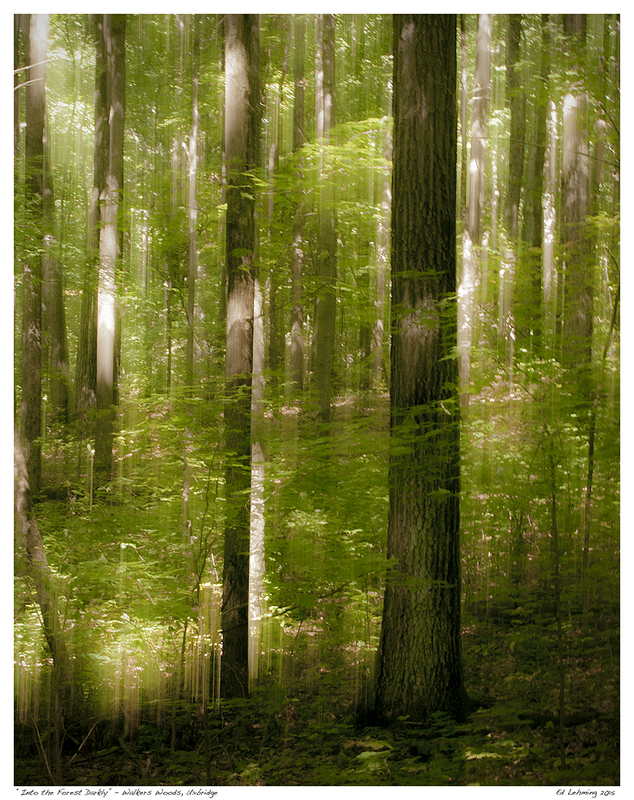 This entry was posted in Photography and tagged abstract, conservation, forest, green, lunch, moments, Nature, ontario, peace, relax, trees, Uxbridge, walk on September 16, 2015 by Ed Lehming Photography. Another image from last evening’s “Reservoir Walk”. I could do a whole book on this beautiful place, just minutes from my doorstep, and often overlooked, even by me. Just north of my home is a reservoir designed to control flooding in case of heavy rains. This reservoir is part of an entire conservation system install in the 50’s when hurricane Hazel caused tremendous damage in the area. The result is a wonderful pond, bounded by woods and a nice trail system. The area was deliberately planted to encourage a natural look and reduce erosion. And, nature has a mind of its own that supersedes out human endeavours. Now the area is a mix of planted shrubs and nature’s own handiwork. It seems like a ‘nice’ place to walk, but I have had many awesome photographic moments in this humble location. Yesterday, I went out in the evening because the light was so wonderful. The reservoir trails change appearance by the hour, as the light warms and cools, and the sunlight changes direction. Last night the sun was just beginning to set and did a marvellous job at lighting up the sumac leaves, many of which have begun to change colour to their bright oranges and reds. This particular cluster caught me eye and I was able to capture it nicely, without too many obstructions by doing a long zoom to 300 mm. 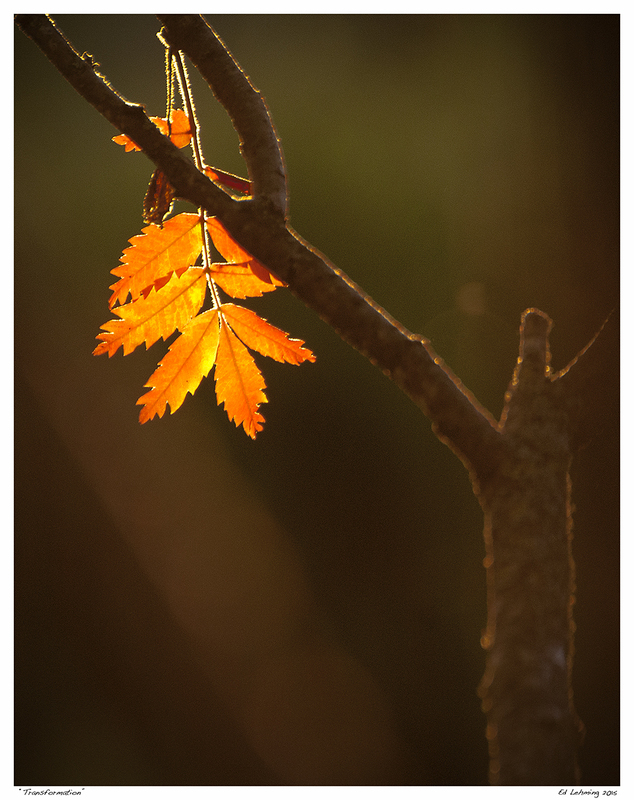 The combination of the golden sun backlight and fall colours really made this ‘pop’. I hope you enjoy it. This entry was posted in Photography and tagged fall, light, Nature, peaceful, Pond, red, reservoir, serene, Stouffville, sunset, walk on September 15, 2015 by Ed Lehming Photography. September, the month where some days convince you that summer will last for weeks, yet others are stern reminders that change is inevitable. This holds true this year. After weeks of above average, sweltering days, the temperature plummets and we layer on hats and sweatshirts, wondering if this summer has passed us by. The saving grace, for me is the gradual change of colours. The once verdant trees begin to shift to shades of orange and yellow. I do like the change and variety this time of year brings with it. I recall the days of new growth and flawless leaves. As I look around me now, those leaves are showing evidence of the hardships of days in sun and heat bring on. Edges are browned and shrivelled. Black spots of age dot the once pristine surfaces, leading to the inevitable fall. Such was my walk today. The grove of poplars pictured above was a beautiful range of bright greens and yellows and the wind made them dance with life. Above me, a falcon disturbed the sparrows, who fled his hungry eyes with shrill chirps. The whole forest was alive with activity and bathed in glorious golden light. I was happy to get out with my camera again to enjoy and capture this unique moment and, hopefully, bring some of that joy to others. 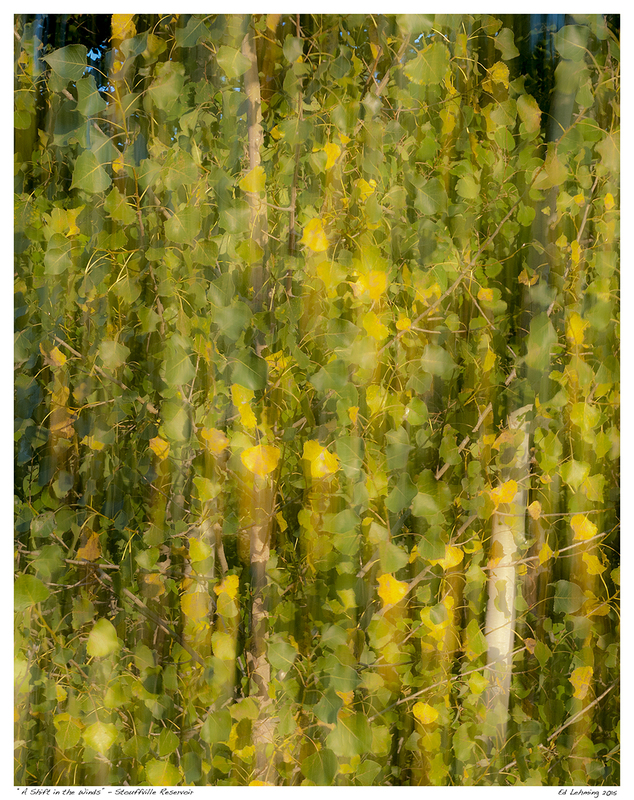 This entry was posted in Photography and tagged chnage, decay, fall, green, Nature, poplar, September, Stouffvile, Tree, yellow on September 14, 2015 by Ed Lehming Photography.